Technical problems that have extinguished Ireland's only eternal peace flame have been described as "deeply disappointing." The flame, housed in Londonderry city centre's Peace Garden, has not burned since late October. It was first lit in 2013 as part of the Bright, Brand New Day peace initiative. Its organiser said the flame has been beset by problems since its installation. Reverend David Latimer of First Derry Presbyterian Church told BBC News NI the cause of the technical problems was unknown. "If the gas supply fails, an electric continuation is meant to kick in but that has never seemed to work properly for us," he said. "It really is a mystery why this is the case and deeply disappointing. "This was to be an eternal flame. Perhaps it is a sign that peace is never straightforward, never without its bumps and bends in the road." 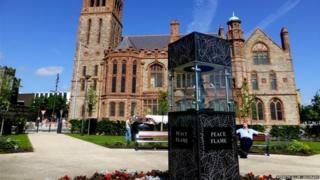 The Derry flame, one of 15 Peace Flames across the world, is maintained by Derry City and Strabane District Council. "The council is to be commended for exploring absolutely every avenue," Mr Latimer added. "We just don't know what is behind these problems." The council said a regular maintenance regime was in place where the equipment was inspected and tested every six months. "The system can be intermittently affected by some environmental factors such as low gas or adverse weather conditions which can disrupt the service," the spokesman added. The flame was a centre piece of a five-day peace initiative, which ran during Derry's year as UK City of Culture in 2013. Among those to attend its unveiling was Martin Luther King III, son of American civil rights leader, Martin Luther King.